Exhibition Digital Memories presents the artworks of two contemporary Slovak artists – Martin Kudla and Richard Kitta. Although they are both different thematically their creation overlaps in reflection and the search for the essence of visual language and meaning of creation. Martin Kudla speaks about the paradigm shift as a painter with undeniable knowledge of art techniques which uses in subtle monochromatic color with references to the contemporary fields of the art world. In the cycle Digital Memory he presents a number of levels – from the narrative over abstract to geometric ones. Within his focus he aims to "feel" precisely and percept the digital world, where is possible to feel the illusion of real by illusion of virtuality, as in his "analog photoshop". He uses temporal signs of computer icons (iconography) and archeologically explores the digital traces of humanity. "Maybe in 3000 a.d., my hand-painted records will be detected and decoded by the inhabitants of Mars." (author). 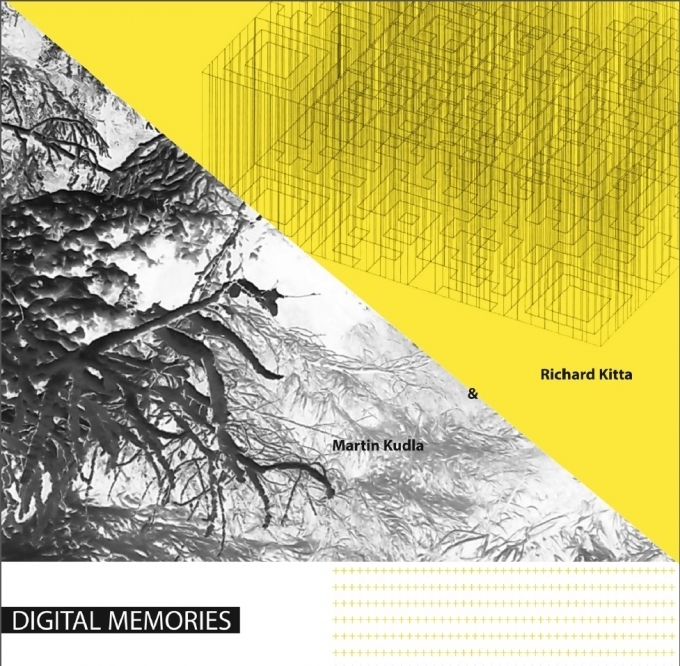 Richard Kitta approach to the theme of digital memory with his more playful way. The actual expression, however, does not seems to be ironic, but in this case he looked upon the secrets of visual poetry. In the cycle QR Basho he transformes the haiku poems into spatial QR codes, his computer-generated graphics also act as architectural fragments or proto-urbanism utopian plans. In the cycle Visual Translations he works with special technology of the visual translation, by which he challenges the question of universality of images in a globalized world. Kitta uses the minimalism to focus on the marginal signs in a language, that are crucial for the semantics of the artwork. Richard Kitta - Multimedia artist, poet, publisher, culture activist and university teacher. He is mainly interested in creating of interactive objects, screenings and environments as well as visual poetry. Since 2012 he runs the continuous visual poetry open project – New Poetry Forms. Studio at Faculty of Arts TU Košice.